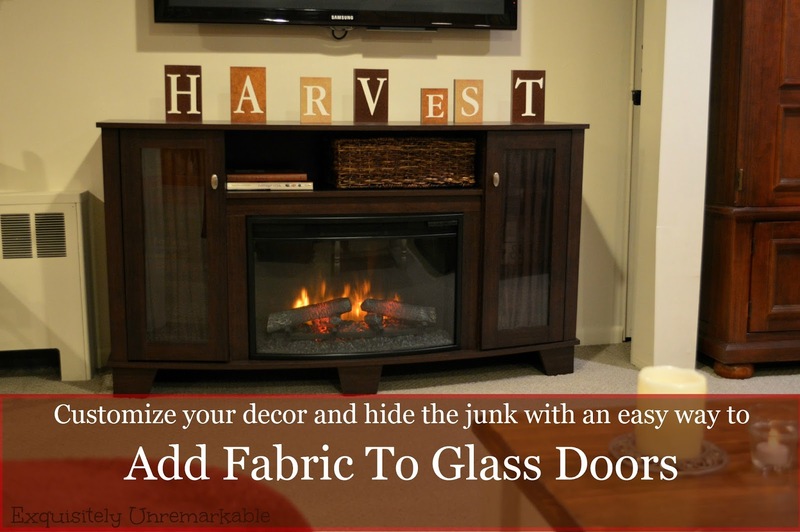 Here are 10 easy ways to decorate your home with fabric. 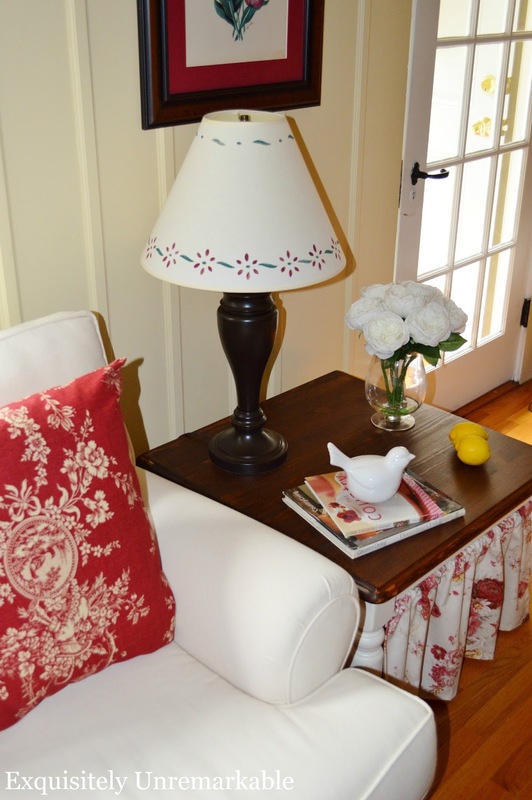 Add charm, warmth and pattern in no time with this quick and elegant fabric DIYs. Hello friends! So last week, when I gave you a sneak peek of my in process, summer living room, I received a ton of comments and emails about my little skirted side table. More people were interested in that piece than anything else in the space...which is funny, since it's been a staple in the room for years. It was featured, along with the complete how to, back in 2014, but with so many inquiries, I decided that maybe I should share again. Then, I began to consider the people who asked about the curtains, the pillows and how I was going to recover the chair in the room and I thought, hmmm, maybe I should just round up all of my home decor fabric ideas in one place and answer all those questions in one fell swoop. Maybe you've seen these projects before, maybe you haven't. I also thought it might be handy to have the posts all in one place if the mood to decorate with material strikes you in the future. We aim to please here at Exquisitely Unremarkable. Adding fabric is the quickest way to add personality to a room. It has the power to transform like no other design element. However, for some, it can be a daunting task. I hear it all the time. People tell me that they can't sew, so they avoid fabric altogether. And that makes me sad...because sewing and decorating with fabric are two totally separate things. Yes, it is helpful to know how to sew, no doubt about it. However, there are always ways around sewing if you are a DIYer and if you would prefer to purchase items, great, there are so many affordable options today. I just hate to see people avoid these types of crafts because they don't know how to stitch. Trust me, no one is inspecting your seams. Keep in mind that all of these fabric DIYs can be accomplished without one single stitch. Anything I do with a needle and thread can be accomplished with fabric glue or tape. So without further ado, here are 10 easy ways to decorate your home with fabric. This is the skirted side table that garnered so many inquiries over the weekend. I just adore it. Still. It was a super easy DIY and with one little trick, that table, and the room, were transformed in a jiffy. Once I began skirting tables, I couldn't stop. This was another IKEA special that I transformed with fabric and a few ring clips. They slide easily and create an awesome storage area that is very accessible. Form and function. Gotta love that. 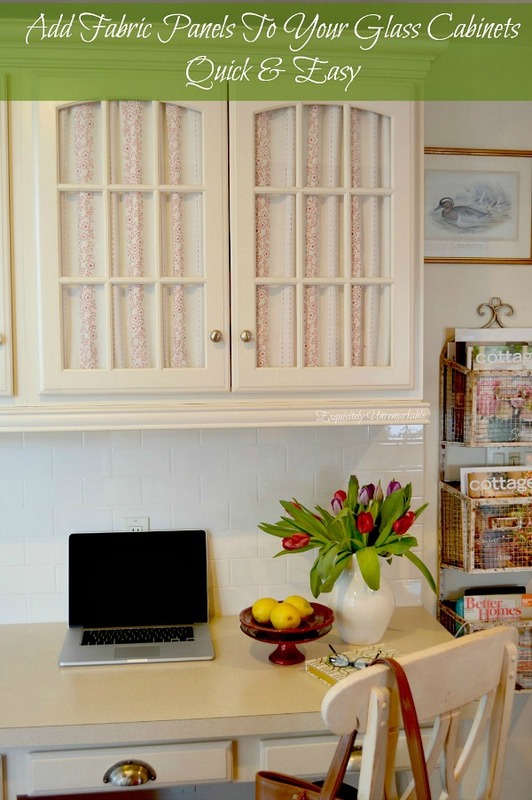 Want another quick way to hide clutter? 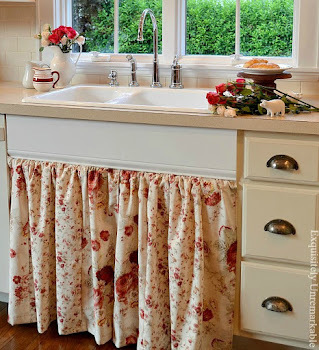 Add fabric to glass paneled kitchen cabinets. 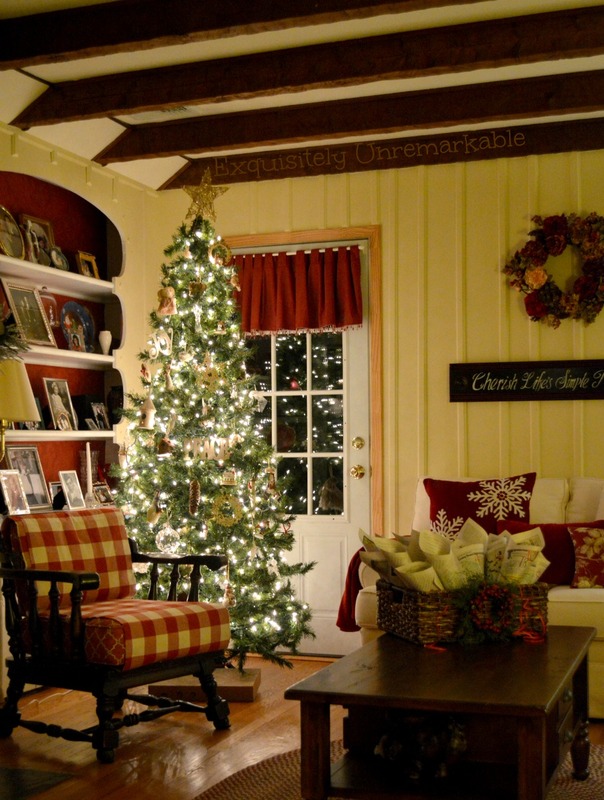 It not only hides the junk, but it also warms up the room and adds a ton of charm. Plus, it's another opportunity feature some red! This technique works equally well on furniture pieces, too. Hide those tv controllers, games and old DVDs while creating a coordinated and customized look in less than fifteen minutes...and there's no sewing at all. 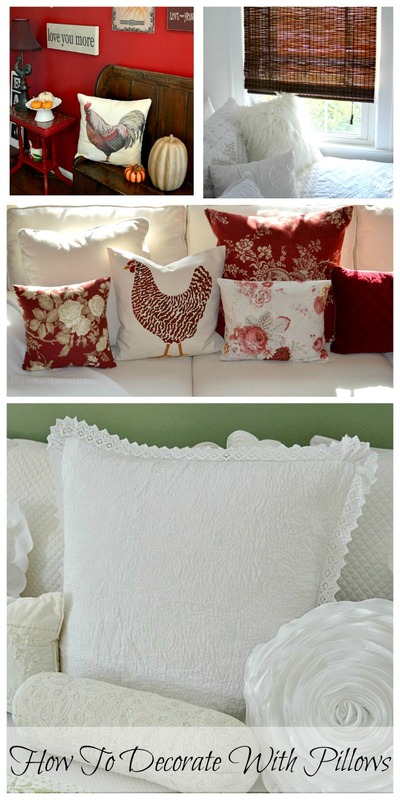 I'm not all about storage, sometimes, the fabric is used just for decorative purposes, like my pillows. I have lots and lots of pillows. Some of them, I have purchased, some of them I have made. Either way, they add a softness and personality to the room that can't be achieved any other way. I have also used fabric to upgrade and repair. My reupholstered (sort of) patchwork chair, was torn in too many places to patch, so I created a seat cover and skirt to fix it and ended up with a fantastic custom designed chair. It's a statement piece and sets the tone for the whole room. Cottage style kitchen anyone? It's also my favorite seat in the house. Of course, with all these fabric projects, I have lots of scraps hanging around. 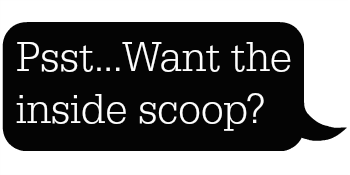 Waste not, want not, so I made a banner. 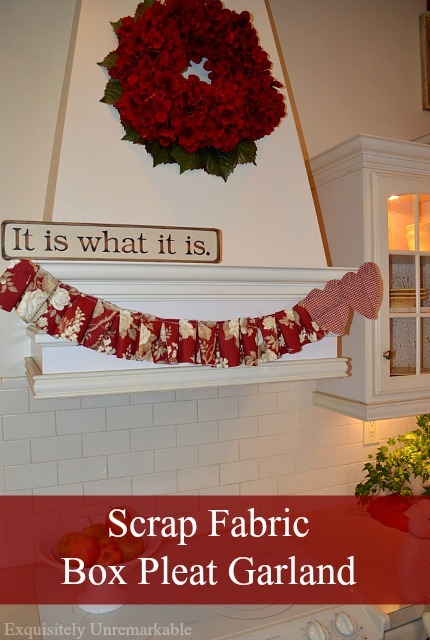 Fabric banners are a great way to decorate for holidays or any day...there are many different versions. I chose to whip up a box pleat garland with my leftovers. It's a bit unexpected hanging over the stove, which makes it even more interesting. See that chair in the corner? Great fabric right? I love that buffalo check. Unfortunately, I didn't have enough of it to cover the whole chair properly (nor did I want to sew). That's ok, I just wrapped the cushions with what I had and tucked it in tight. It didn't move and I had the perfect look for my rustic Christmas living room. 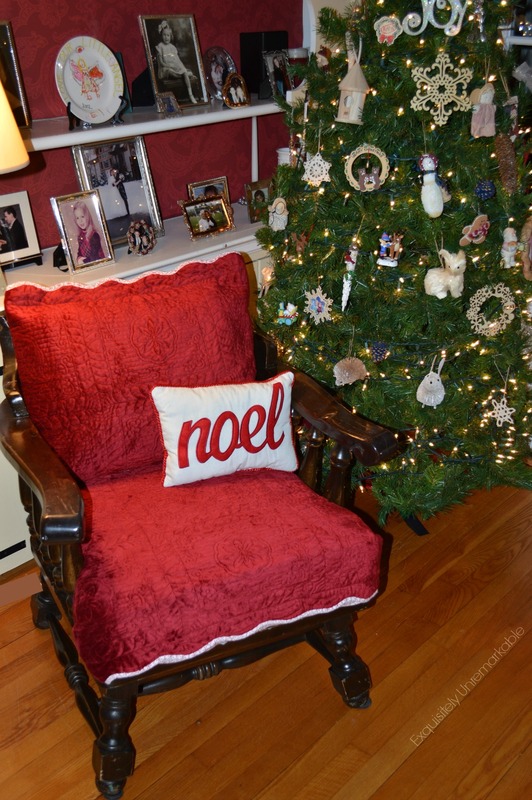 And when Christmas was over, I just unwrapped my chair! 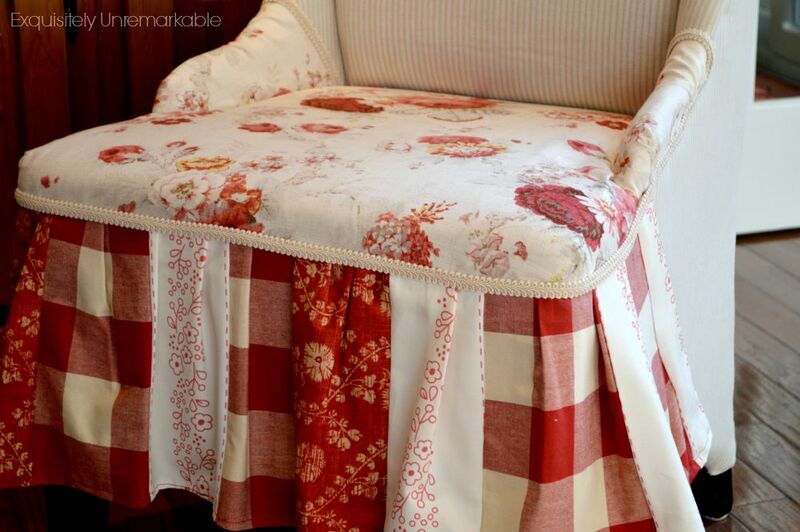 Another way to temporarily change up a chair is with pillow shams. Yup, just place the cushions inside the shams and voila! Instant transformation. Craving a different look? Grab another set of shams. I pick them up on clearance or at the thrift store. That chair is going to be white soon...unless I find something else in my search. Last on the list, but certainly not least, is curtains. Window coverings are the absolute easiest way to decorate your home with fabric. They are right up there with pillows when it comes to defining the style of a room and adding warmth, charm and personality. Whether you choose full drapes or a dainty valance, the addition of fabric to any window will completely transform a room. And there you have it, all ten ways to decorate with fabric. Whether you can sew or you can't. The fabric doesn't know the difference. I'm one of the ones that noticed that pretty skirted table...love it so much! Thanks for all the info! I have always adored that chair! That was beyond genius! 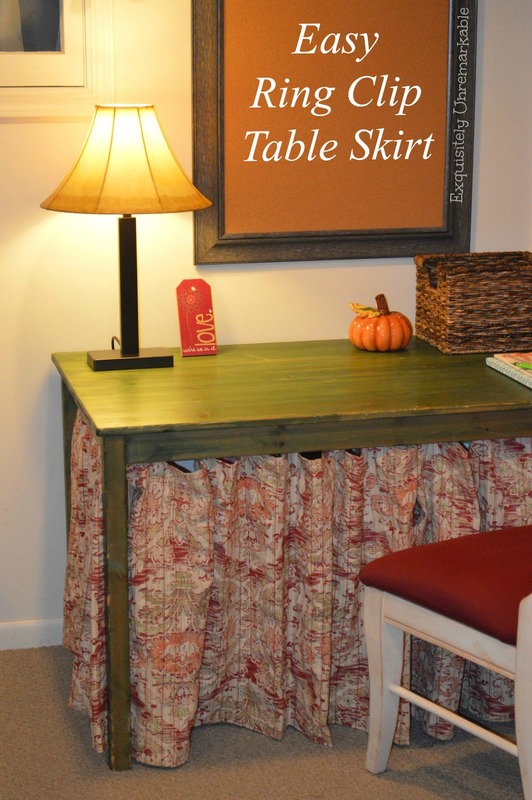 I love those skirted tables, and now I'm thinking I'm going to skirt my old desk! I really like Waverly fabrics so the projects with those caught my eye! I am also a red fan, and the chair cover is great! I also have used fabric draped over a chair or tucked in to change up a look for a season. I love the Waverly patterns, Deanna. They are some of my all time favorites. Your beautiful fabric creations are what got me to start following your blog! Love all these ideas, especially the skirted tables. Love love the skirted table. All your ideas are so great Kim. So creative for someone that does not sew. Have a great rest of the week. The power of fabric is second only to the power of paint in my book Kim! I too love using fabric to transform. In fact I have a whole stash of old clothes that I we no longer wear but I've kept them simply because the fabric is so pretty. I love all your ideas and how you have stayed true to your vision of using red! I love the idea of using old clothes, Mary. I have some stashed away, too. Now I just need a crafty idea to use it all on!! Wonderful ideas! It truly is amazing how a bit of fabric can change the whole character of a room, and of course it makes it even better when it is red! Have a great week. I totally agree, Lynn!! And thanks!! 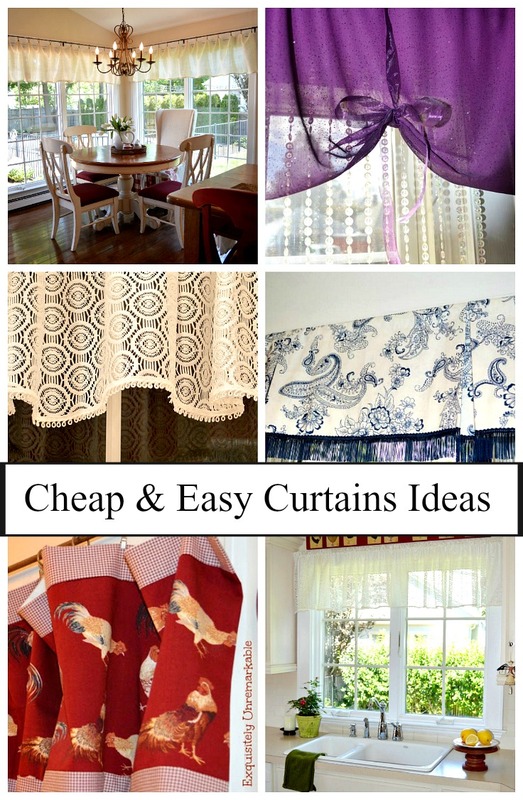 Thanks for sharing all of these ideas to decorate the home with fabric. I like the one for the TV stand. I have a similar stand and I will try to maybe do the same to mine. I love how creative you are with the fabric and you make it all look so easy. Thanks!! You are the queen of no-sew fabric projects, my friend. Love them all because, you know, they're so cottagey and I'm all about that! Hugs. Fabric and paint are two of the most powerful items to decorate with, and you're right....you don't have to have a sewing machine to achieve most of these looks. Thank you, I love that chair, too, Doreen. I really can't believe I made it most days. Thank you ... so creative and helpful. I have a chair waiting for a TLC ... and I plan to use your tips. Awesome, Carla! Keep me posted! !